Welcome to Warrior Wednesday, FighterSweep! It is our hope to make this an ongoing feature, one focused entirely on the amazing men and women who play instrumental roles in our national defense. For this week’s inaugural post, we’ve chosen our good friend Lieutenant Colonel Cameron “Glover” Dadgar. He is a senior pilot with more than 2,000 hours in training, transport, and fighter aircraft to include: T-3, T-37, T-38, AT-38, F-15, F-16, Saab JAS-39 Gripen, and Panavia Tornado. Lieutenant Colonel Dadgar was commissioned following graduation from Purdue University in 1994. He spent his early career launching Titan II and Titan IV Space Launch Vehicles with Air Force Space Command. After applying for and attending UPT, Dadgar flew operationally in during Operations Northern and Southern Watch as well as Operation Iraqi Freedom in the Viper. Lieutenant Colonel Cameron “Glover” Dadgar briefs members of the news media on Red Flag operations while acting as the Deputy Commander of the 414th Combat Training Squadron. Additionally, during his tour in the Air Force Intern Program, he served on Joint Staff Operations Directorate and was on the SECDEF’s speechwriting team. He also served in the US Embassy-Turkey, leading EUCOM priority Theater Security Cooperation initiatives. Finally, Lieutenant Colonel Dadgar came to his current job from being the Deputy Commander, 414 Combat Training Squadron/Red Flag. 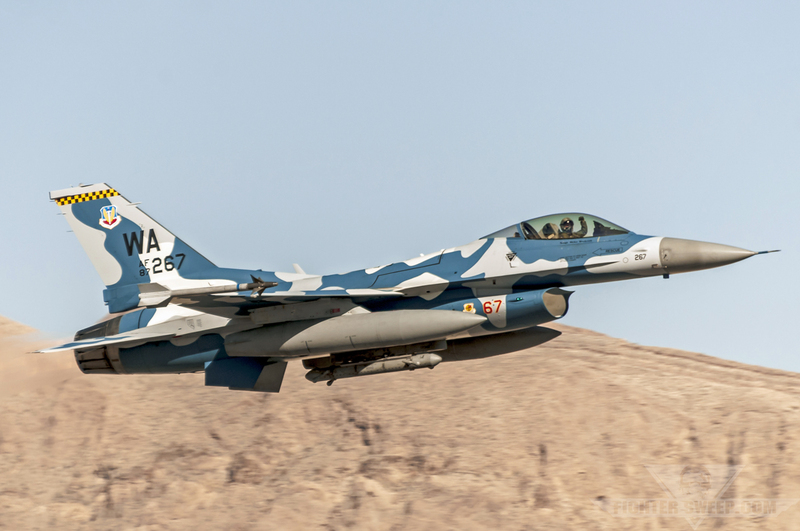 Dadgar is the Commander of the 549th Combat Training Squadron and still maintains his qualifications in the Viper with the 64th Aggressor Squadron at Nellis Air Force Base. As the 549 CTS/CC, he leads over thirty personnel in providing the world’s most contested, realistic and demanding combat exercise known as Green Flag-West. During Green Flag execution, he is responsible for more than 5,000 Joint/Coalition warfighters in near-peer, Major Combat Operations training. 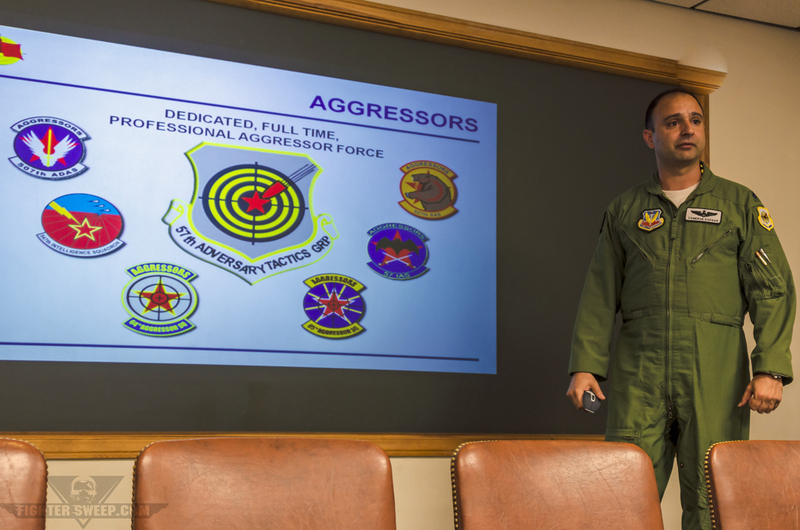 As an Instructor Pilot and Aggressor with the 64 AGRS, Dadgar is a Subject Matter Expert responsible for teaching and training joint warfighters against adversary tactics and weapons systems. FS: Since you have assumed command of the 549 CTS, what major changes have you seen in the Green Flag-West CONOPS? Glover: Green Flag is the premier training venue for the Air Force where the CFACC is the supporting commander. Air Force service training objectives in many core competencies are surpassed at Green Flag preparing forces to meet Combatant Commander requirements worldwide. The exercise has become increasingly Joint without the loss of any support to Army training objectives. Forces integrate with the US Navy and Army against a near-peer threat that is integrated across Air, Space, Cyberspace, Land, and Sea. 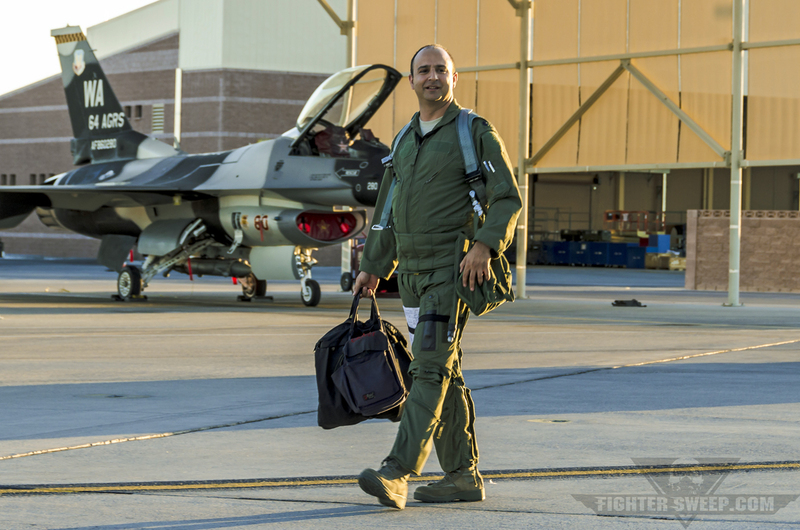 Lieutenant Colonel Cameron “Glover” Dadgar steps to his aircraft prior to a training mission during Red Flag. FS: I understand the program has made a training paradigm shift from COIN to A2AD within the last year or so. Could you speak to that? Glover: The exercise has significantly increased the threats to air operations over land and sea. We need to continue to train forces for the more difficult problem of executing Air to Surface mission sets against a willing and capable adversary that is well equipped in numbers and technology. The venue is now a fully contested environment. FS: From your perspective, in light of today’s current conflicts and potential future conflicts, how important is this training for the Joint Air-Land team? Glover: Extremely important. Combined with Red Flag, Green Flag completes the entire mission set to prepare the Air Force to execute at its highest capabilities in all realms against all enemies. The assets available to Flag level exercises are unique to set a Contested, Degraded and Operationally-limited training environment so that if units are called upon to face a near-peer threat, they will be more than ready. 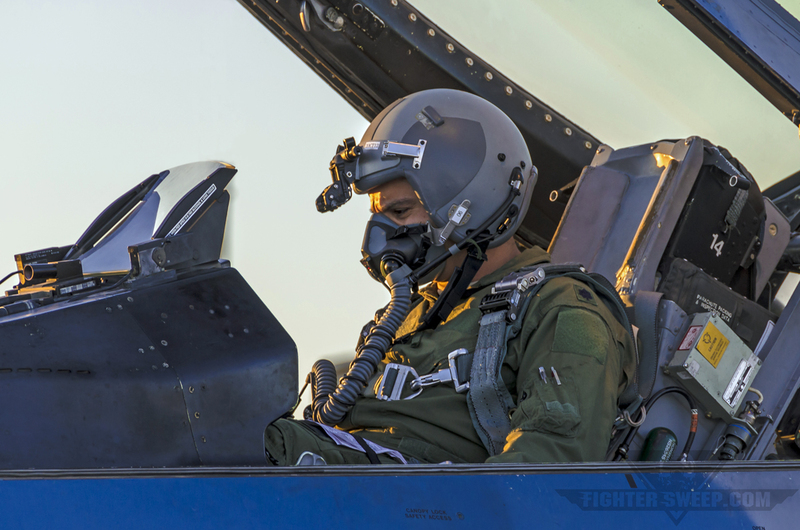 Lieutenant Colonel Cameron “Glover” Dadgar goes through his checklist prior to starting his F-16 for a training mission at Nellis Air Force Base, Nevada. FS: Due to fiscal constraints DoD-wide, how have you needed to adjust your program? Are there fewer iterations each year, or are you still running the normal ten? Glover: Due to the need for forces to have a capstone exercise prior to deploying, Green Flag has not been afforded the opportunity to slow down – if anything, the exercise has picked up in its tempo. Hurdles caused by fiscal constraints have been answered by the ingenuity of the personnel in the 549th and 12th CTS on the west coast and by the 548th CTS in the east. Green Flag continues to be a great steward of tax payer dollars getting the absolute most out of every dollar allotted. FS: Anything new that you’re going to be incorporating into the program that you are able to speak to? Glover: The inclusion of the AOMSW (Air Operations in Maritime Surface Warfare) mission for fighters and bombers, the inclusion of professional Adversary Air, the expansion of the exercise to include operational level training audience with the first ever Combined Air Operations Center (CAOC) play, additions in training for the C2ISR community to include, Distributed Ground Stations analyzing full motion video, scenarios built top down to ensure combatant commander requirements are met, integrating the OPFOR across air, land, sea, space, and cyberspace just to name a few additions to the exercise. Lieutenant Colonel Cameron “Glover” Dadgar departs Nellis AFB, Nevada for a training mission with the 64 AGRS. FS: If given an open forum, what would you tell the average citizen about the importance of Green Flag? What would you say to senior USAF or Coalition Leadership? Policy Makers? Glover: Green Flag prepares our warriors like no other exercise out there. It ensures our brave warriors are ready to face a myriad of threats in an unlimited set of circumstances. It is a Joint exercise with outstanding service benefits in terms of ensuring readiness. We thank Lieutenant Colonel Dadgar and MSgt David Miller of 99 ABW/PA for facilitating this interview. Stay tuned for our next edition of Warrior Wednesday!